For many patients, being watched overnight is a sign of weakness or fragility, as well as an invasion of privacy. To them, this form of care is insulting and unwanted. However, while those might represent their immediate feelings, the benefit of supervisory care in these situations cannot be underestimated. Oftentimes immediate family isn’t close enough or available to watch over relatives, and in such situations having outside help can be a lifesaver. 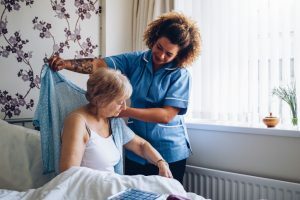 While it may take some adjusting, having a caregiver on site to help puts less strain on the elderly and ensures that they don’t injure themselves. Unfortunately, the general public’s lack of awareness about the reality and benefits of overnight care often leads to assumptions. Many people assume moving into a residential care home to be the only option. While it is a perfectly viable choice, most people who require care would much rather stay in a familiar and comfortable environment. Moving to a new location may present more than just financial challenges, so it’s best to consider which approach better fits your needs. For most adults, when they begin nearing 75 years old it becomes difficult to perform simple tasks. Movement and lifting can present physical problems, and a slip and fall could necessitate serious surgery. While not every elderly person needs someone to assist them with basic tasks, some individuals who are known for being clumsy or careless might need a helping hand to ensure they don’t injure themselves. Likewise individuals with a declining mental state who have difficulty remembering simple information shouldn’t be operating a motor vehicle or machinery and needs some assistance. If you notice the declining health of a relative who has difficulty with motor skills or mental functions, it might be time to discuss a live-in care situation with them. It’s much better to broach this subject early than after a major accident occurs. These are just a few of the many benefits to having an in-house care provider. Additionally, there’s no need to give up familiar surroundings, community, or local family and friends to receive excellent care. A caretaker isn’t just someone to watch over an elderly adult, but a friend and companion to take care of them. If you notice your parent or friends are in need of assistance, consider talking to them about hiring a caretaker. While it may not seem like an ideal situation initially, it’s the best way to take care of them in the long run and prevent potential accidents. This entry was posted in Caregivers, Tips and tagged 24 hour care, caregivers, overnight. Bookmark the permalink. Comments are closed, but you can leave a trackback: Trackback URL.